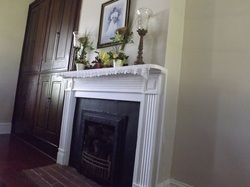 The McConnell House is maintained, operated and supported by The Heritage Arts, Science and Tourism Center. The HASTC is a 501(c)3 Non-Profit organization which derives it's support from tax deductible private donations, corporate donations and grants. If you are interested in becoming a partner with the HASTC to ensure that the gorgeous, vibrant and historic McConnell House is available for generations to come to enjoy, there are several ways you can do this. All donations made to the HASTC are tax deductible. if you are interested in supporting us financially you can donate directly from our website securely with PayPal. All donations made via PayPal go directly into an account set up for the HASTC so they can be used according to the needs of the house. The costs of operating and maintaining The McConnell House are fairly great. Utility bills, lawn care, and restoration are among the greatest costs that we have so your donations are greatly appreciated in advance and will be used to secure the availability of this 19th century historic landmark for the entire community to enjoy. The McConnell House is solely ran with volunteer power. Constant help is needed with maintenance, event staffing and restoration as well as logistical needs. If you are interested in becoming a McConnell House volunteer, it is a great and fulfilling way to support the HASTC. You can contact the president via email at president@mcconnellhouse-ky.com or by phone at (606) 694-0504 for information on how to become a part of our volunteer force. The HASTC organizes several events annually including a Croquet Tournament in September, a Kentucky Derby Party in May, the Big Ol’ Singin’ Gatherin’ in June, the Old Car Cruise In in July and High Teas in March and December. The proceeds from all of these events go directly into the operating funds for McConnell House. These events are fun way to spend a day or evening and is one of the most fulfilling ways to support the HASTC. The HASTC has worked hard to restore and preserver The McConnell House for everyone to enjoy. Making the home available for everyone to rent for private events is both a way to give back to the community and a way to raise funds for the operation of the home. You can rent this stunning location for private events by the hour. It is a perfect location for weddings, receptions, parties, banquets, or any other formal/informal occasion that you may need it for. Contact the events coordinator, Bud Matheny via email at events@mcconnellhouse-ky.com or via phone at: 606-585-1585 for information on private event rentals. Buying something from The McConnell House Store serves a dual purpose. You can simultaneously get great souvenirs for you or your loved ones while supporting The HASTC. The profits from our store go directly back into the operation of the house as well as for further fundraising ventures for the house. We invite you to shop and give to our cause all at the same time!